Boy, have I got an adventure for you! 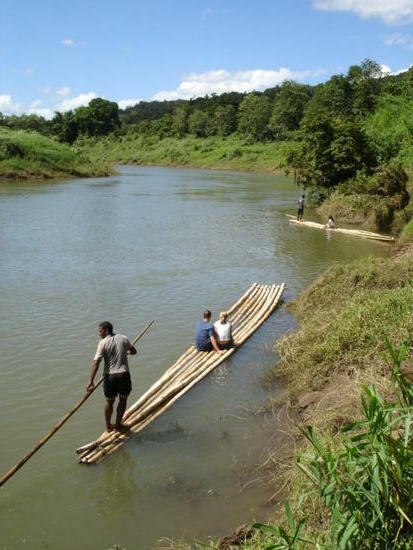 The next time you’re in Fiji, don’t miss the chance to take a lazy trip down a river in a bilibili. A bilibili is a raft made of lashed-together bamboo. It is steered using a long pole, that is pushed down to the river bed. Fijians have been making and using bilibilis for centuries — they’re a regular means of transportation from one riverside town to the next, or out to the ocean. They are a very stable, reliable way to transport people and produce. If you had a huge stem of bananas to carry, you’d be happy to take a ride down the river instead of tramping along all the way. Though if you ask me, I think the trip is have the fun! Bilibilis range in size, from individual rafts to ones that carry over 20 people. Usually, the person who made the raft will steer it for others — it’s not as easy as it looks. It takes years of practice to get used to rolling with the swift currents and avoiding the sandbars! Riding a bilibili can be a romantic trip or a big group adventure. It’s also a great way to get to know local Fijians, as many share the boats with travelers. Every year there are many bilibili races across Fiji. The most famous one is the Annual Bilibili Race in Suva. It takes place over two days along the Sigatoka River — 20 kilometres of it! In 2011 there were 12 teams that competed, each representing hotels and resorts across the country. It’s a fun and exciting way to promote this traditional form of transportation! The bilibili is a sustainable means of transportation, and it’s a great way to see a different side of Fiji. Scenic and practical: How very Pacific Islander!